By Vitaly Polaykov, President of National Academy "Universology"
Lack of systemic approach in the field of multilevel purpose and requirement coordination in the society, a low rate of national development universalization and optimization of processes results in disputes and “unmanageable” situations which do sometimes develop into national tragedies. In order to increase the efficiency of state legislative and executive institutions’ functioning as well as to help forecast their functional development we’ve come up with the need of universal models for effective coordination of multilevel society interests and self-government as a feature of civil society. These are exemplified by Causal systemology, psychosystemology including universal modeling: model 1 constitutes the hierarchy of purpose coordination; model 2 constitutes stage-by-stage forming of relations system; model 3 constitutes current-state prognostication of systems and causal-systemic prophylaxis and the society healthful lifestyle model. The universal models worked out, realize Adam Smith’s proclaiming of “the route to universal equality of condition” and the coordination of human behavior with natural forces by means of submitting of 3 branches of state administration to a (currently regimenting) three branches of public self-government – industrial, territorial and social. This will help decrease disputes in relations involving an employee into the production process as well as involve individuals into the communal life of the society, thus eliminating social indifference. A society, as well as its exponent - individual, is a result of multilevel relations. The development of any system of relations takes place according to universal regularities. Thus, the state machine built on the basis of universal regularities regiments relation layers within the society as people’s room of activities (as structure) and time of its stage-by-stage development providing efficiency. Society structure constitutes poly-dimensional causal relations which are formed by both the society itself and its exponents in the environment. In addition there emerge three domains of life: 1) the managing domain (cause); 2) the managed domain (controlled) (affect, result); 3) the transient process from the managing domain to the managed domain. 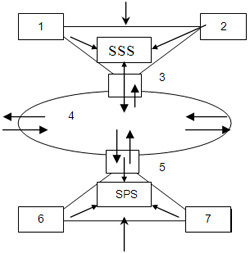 Thus, this premise allows to construct a model of management which could help coordinate the managing domain ends (law) with the controlled domain – individuals’ (family, collective, enterprise, society) room of activity as well as coordinate the society exponents requirements with the state resource. б) the universal model of management system, providing inter-conditionality, universalization and optimization of all links of state management and society. The reiteration of the causal links of management on all levels in social life forms a multilevel state system the structure of which is universal. The only difference between various communities lies in that what stage of development of relations structure passes this certain state. Under coordination of differing levels of purpose and interests between differing systems (people, enterprises, regions, etc.) there emerges self-government which develops into non-disputable development. Fig. 2. Coordination of purposes: from greater system (state) purposes to lesser ones (collective and an individual) and interests – from a person to nation leads to the formation of multileveled self-government as basis of the civil society. It is from the formation of socio-economic systems according to universal regularities(models) of development that coordination begins, considering: 1) structure of space (fig.1,2); 2) algorithm of development of systems (model 2, fig.3,c). Herewith, the coordination of purposes by hierarchy of attractors (model 1, fig. 3a,b) and schemes of multilevel coordination of activities in state are used: branches – industries and its divisions inter-conditioned as triad: subsystem–system–super-system (fig.3,c). b) Model 2 – 3 levels in the system of state; herewith the development of each sphere of public life is formed according to 12 system determinants – stages of formation of a system of public relations as well as coordination of interests of different state grading – this constitutes terms of purposeful development. At the same time Universology as science has grounded a mechanism of person’s still comprehensive involving in public life (i.e employee into the enterprise affairs) which hadn’t hitherto been disclosed. A mechanism of collective strategy construction was also disclosed, from this premise on – the system of public self-government. Herewith, in order that the system of public self-government is formed efficiently the coordination of the three self-governing branches should underlie the formation: industrial branch, territorial and social branch (taking into consideration many countries’ lame experience of this in which sheer “announcing” of the local self-government left nothing but indifference and rejection to take part in). But the regimentation of self-government councils and civil self-government centers in districts, cities and regions is supposed to help realize latent creativity potentials of participants, eliminating the threat of conflicts prompted by the state of being unrealized of the population. Fig. 4 Scheme of interplay of the three branches of self-government: industrial, territorial and social branch within system of public self-government and a model on forming civil self-government center on all administrative and territorial grading of state machine including adjusting committee of experts (ACE). Thus, criminal control and preventive measures taken to deal with conflicts, stresses and diversiform deviations in development will be achieved through the forming of man’s multifold system of relations with the environment and all-round manifestation in public activities. Herewith, it is important to adjust links and connections: 1) System of state self-government (SSS) throughout administrative-territorial grading which comprises exponents of all the three branches of power; 2) System of public self-government (SPS) which comprises exponents of industrial, territorial and social self-government. 4) business- incubator – population instruction in business activity the basis of which is the collective strategy in the system of public self-government. 7. The sphere of moral values and ideals, the global culture values and outlook guiding lines.